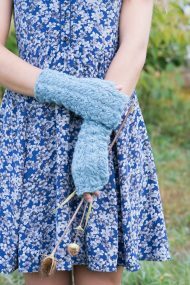 Lightweight, lofty, and luxurious, just like the Piper yarn they’re knitted from, these fingerless mitts are worked in a tessellated combination of cable and lace patterns. Each segment of the pattern repeats over just 12 stitches and 7 rows, and is quite easily memorized. The mitts are designed for a loose, comfortable fit around the wrist and hand. Use needles a size smaller if you’d prefer a snugger fit; use needles a size larger for a bit more room. Finished Size: About 7″ (18 cm) hand circumference (unstretched) and 9 3/4″ (25 cm) long. Yarn: Quince & Co Piper (50% superfine Texas merino; 50% super kid Texas mohair; 305 yd [279 meters]/50 g): 1 skein Guadalupe #603.